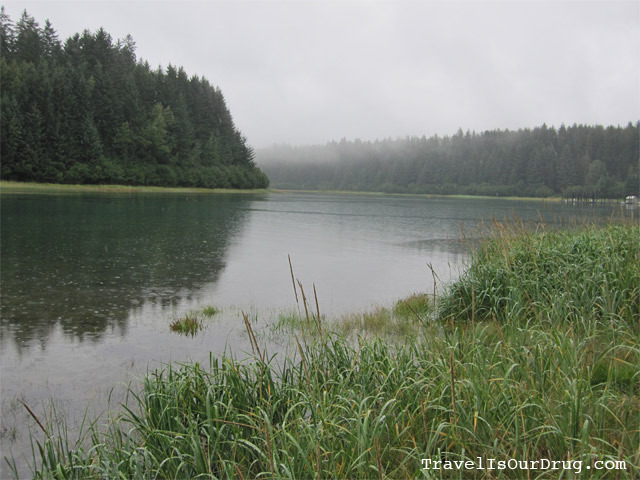 We woke up this morning to steady rainfall, thick wispy blankets of fog and extremely overcast skies – but somehow it never dawned on us that our flight might be affected. We got to the airport at 11:30 for our 1:00 flight to Gustavus only to find that no flights had been able to get out yet today and ours may not either. Super. So we headed upstairs for lunch and a couple of beers while we waited it out. The guy working the bar was friendly and chatty, so we learned a lot about Juneau while we ate. He told us that this has been Juneau’s best summer in about 10 years – two days above 80oF and more sunny days than average. Lucky us, showing up just when the rain does. Last summer, Juneau had 34 straight days of rain and only two sunny days. Talk about depressing. The bartender chatted the entire time we chowed down on our Alaskan halibut fish n’ chips. And we found out at the end of our trip that Juneau is no exception to the rule that airport food prices are inflated about 1837420%. We had two fish n’ chips platters and three beers (total, not each) for $52. Yikes. We wandered back down to the Wings of Alaska counter around 12:50 to find that still not flights had left and there were no signs of improvement. We were starting to worry that we’d have to skip Glacier Bay to keep the rest of our schedule, and sat down in the small, crowded waiting area feeling extremely antsy. We watched TV in the waiting area for a while, impatiently willing the grey skies away. Several locals were waiting as well, none of whom seemed the least bit antsy or impatient. I guess when you live in Juneau this is just a way of life and you get used to it. Finally, around 1:30, they announced that conditions had improved enough to fly. Woooooohooooooo!! Our Wings of Alaska flights were a 2-for-1 deal through the Alaska Tour Saver. We paid $180 total for both round-trip flights, which was completely worth it. 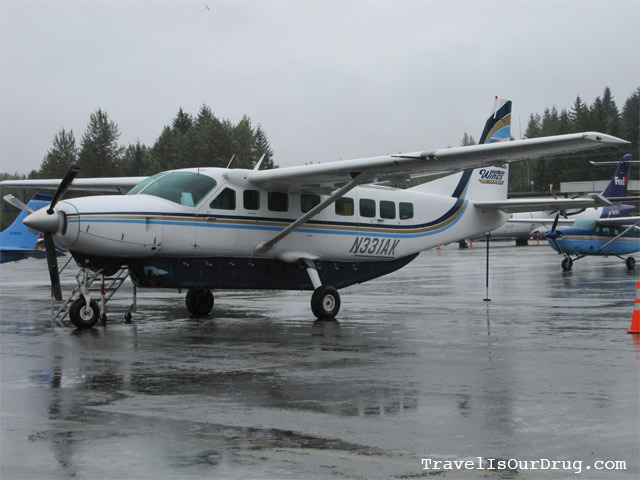 Flying Wings of Alaska was a very different experience for us. the airline counter and check-in was on the ground floor of the airport, not upstairs with all of the other airline check-in counters and gates. When we checked in, we walked up to the counter and told them we were here, they took our bags, and that was it – no tickets, no security, nothing. When our flight was ready, they came into the waiting area and called our names and we walked right out across the tarmac to our plane – no security check points or screenings, no baggage searching or screening, nothing. It seemed a little absurd, but nice to not have the stress of taking off our shoes and jackets, pulling out our electronics and liquids, etc. 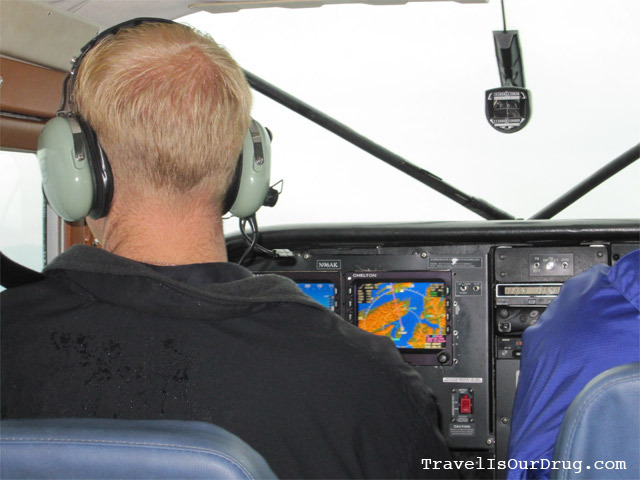 We flew in an eight-passenger Cessna…jet? (I don’t think it’s really big enough to be considered a jet, but then again I don’t really know all that much about airplanes.) This is definitely the smallest plane either one of us had been in before. 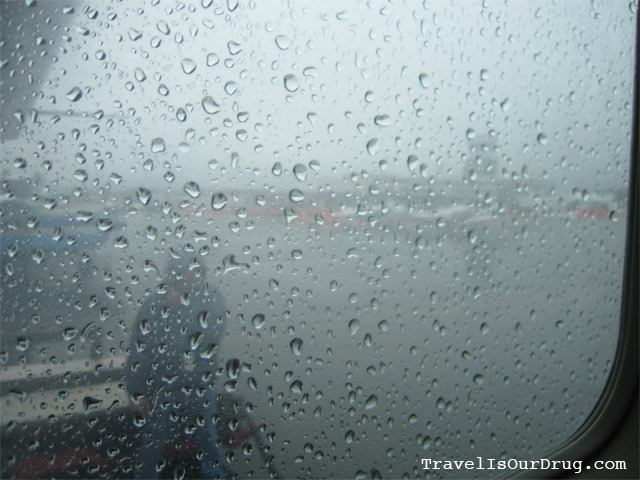 As we sat and waited for other planes to clear so that we could taxi, the rain was still drumming steadily on the metal casing of the plane. I could barely see out the window for all the raindrops, and I was hoping with every bit of hope that we would be able to take off. And thankfully – after another 20 minutes of so – we did. I got to sit right behind the pilot. (Another passenger got to sit as co-pilot. How cool is that?!) It was really neat getting to watch the pilot operate all the controls and gauges. It was especially neat to watch the navigation system, showing that we were flying over some pretty big mountains even though we couldn’t see even a trace of them through the thick layer of fog. It was so fogged in, we couldn’t really see anything until we were nearly on the ground in Gustavus. I was really surprised when we pulled up to the Gustavus Airport. It was just a small little cabin in the middle of an asphalt parking lot. Inside was a tiny cafe, a small waiting area with books and magazines, a patio and a check-in counter. That’s it. All within one room. Behind the check-in counter was a door, standing open, leading into a garage. The woman working at the check-in counter walked into the garage, got into a mini van, drove it about 100 yards out to our plane, loaded our bags inside and drove the mini van back into the garage. Then we picked up our bags from the back of her van. It was really different, but nice to have such a no-fuss flying experience. We were greeted at the airport by a Glacier Bay Lodge representative in a shuttle van. We drove through the town of Gustavus – about 10 houses, a post office, a school, a fire station and a “mall.” The mall was a large cabin with probably 4-5 stores at the most. City Hall was a tiny green cabin set back in the trees. The big intersection in town is referred to by the locals as “The Main Road” and “The Other Road” and there aren’t really any other roads. At the intersection, there aren’t any stoplights or stop signs or anything; just the intersection and your own judgement and caution. The road out to Gustavus (“The Main Road”) was long, flat and pretty straight. 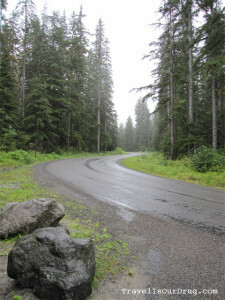 On both sides of the road were thick, thick forest like nothing I’ve ever seen. 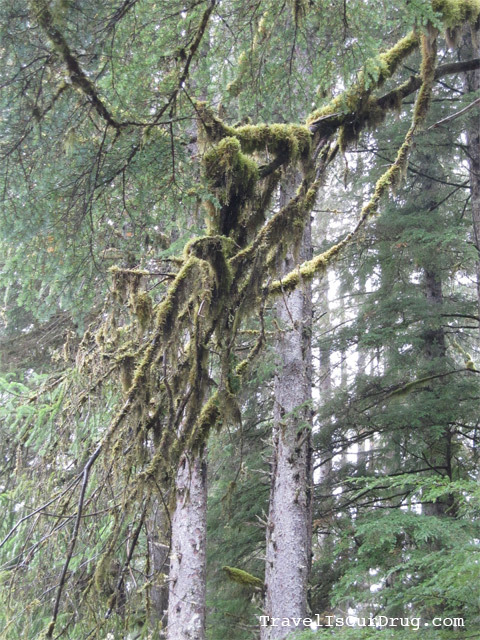 Sitka pines and spruce are the only trees the grow here, and the ground and trees are covered in super thick blankets of moss. The moss just hangs off the trees’ branches and grows parasitically on the trees’ trunks. The shuttle driver told us it’s really common to see bears, moose and porcupine along the road, but we weren’t lucky enough to encounter any today. Glacier Bay Lodge was very quaint and cozy, set back in the trees right on the water in Bartlet Cover, which is the entrance to Glacier Bay National Park. 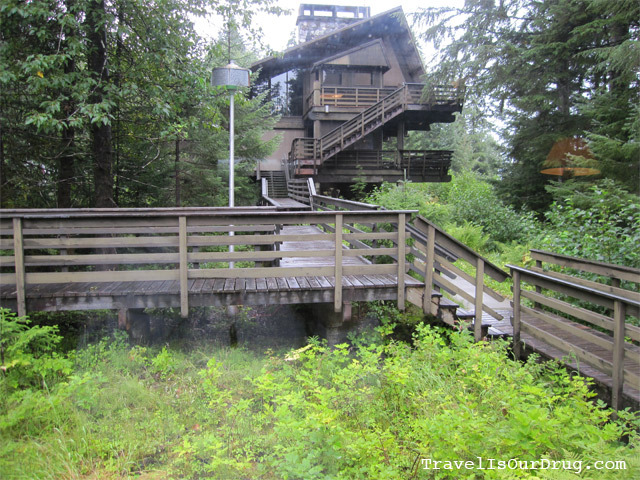 The main lodge had a sitting area with a huge fireplace, a small restaurant, a gift shop and a visitor’s center. All of the rooms were accessed from the outside and we got to our room via a bunch of boardwalks that spread around the property. 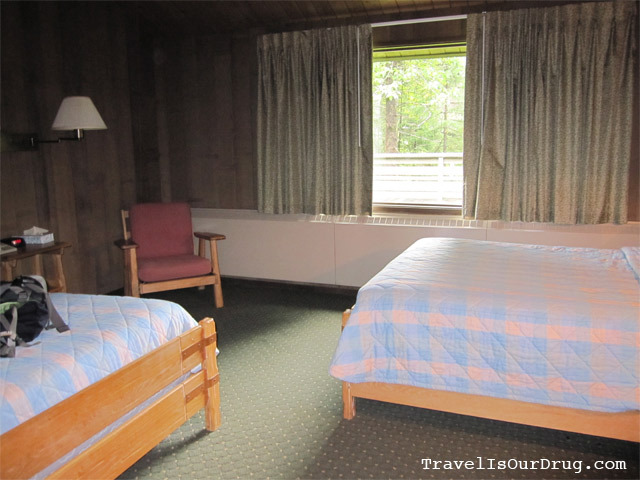 We were assigned to #27 – a quaint, humble little room not too far from the main lodge. It reminded me a lot of our cabin in Curry Village in Yosemite a few years ago. The room had two full-size beds, a small desk and chair, and a basic bathroom. No TV, which I LOVED, and no other technological distractions. Not even our cell phones would work out here. 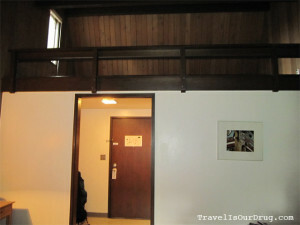 There was also a loft that was set off with a railing and not accessible (maybe at one time it was?). The heater was a hot water radiator, which was pretty inefficient, so even with the heat on full blast, it was still pretty cold in the room. Yesterday, the 58oF in Juneau felt nice. Today, with the chilly air and rain, I had a hard time staying warm and really wanted to room toastier than the radiator kept it. 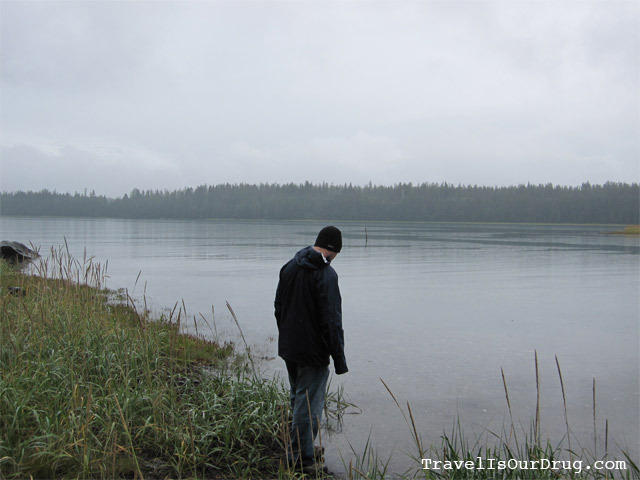 We dropped our bags in the room, put on our raincoats and set out to explore. No time to waste sitting around inside. We walked down along the water and took some really cool pictures of the fog rising over the trees across the cove. The visibility was pretty poor, so hopefully tomorrow will be better. We got in and situated a little too late today to do much hiking, so after a brief walk along the water, which led us back up to the road we’d driven in on, we returned to the lodge. We decided to just hang out in the lodge to relax and warm up by the fire. We also grabbed a few postcards from the gift shop to send home to all the nieces and nephews. After the videos, we headed back to the room to clean up for dinner. As we were almost to our room, we heard a loud rustle in the trees above us and looked up to see the biggest, fattest porcupine hanging in the tree eating. He just sat there staring at us while I took his picture. 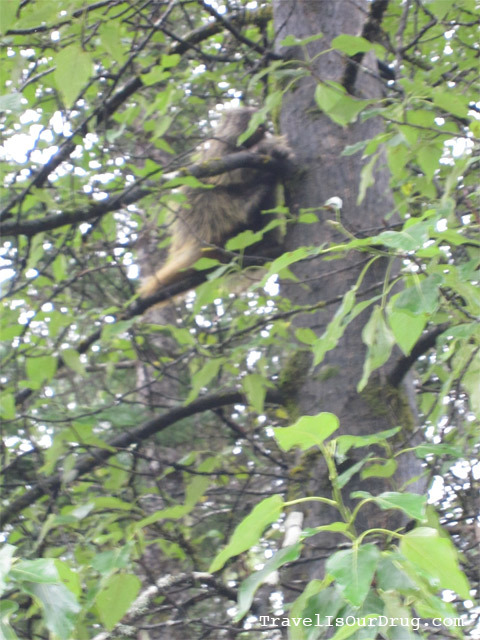 I had never seen a porcupine before, so I didn’t realize how big they were (I was picturing small like a hedgehog) or that they could climb trees. The way he was hanging there eating, he almost looked like a big, prickly koala. We had dinner at the lodge – our only choice out here. I had chicken noodle soup and a Caesar salad. K had clam and salmon chowder and a salad with all kinds of dried fruits and nuts. The food was okay; not great, not awful. It’s only our second day and I can already tell we’re going to get tired of fish. I get that it’s fresh and it’s Alaskan, but there’s only so much a person can handle. Hopefully as we travel around a bit more, we’ll find a little more variety on the menus. After dinner, we sat in front of the warm, inviting fireplace for a bit and talked and played cards. It went pretty well so long as K was winning. (Such a sore loser, that one!) We came back to the room around 10:00. K has been asleep and snoring like crazy for well over an hour. I suppose I should get some sleep, too. I need to be bright eyed and bushy tailed on the boat for the Glacier Bay tour by 7:15. And I am not a morning person.